The most eastern province of Canada is an exciting place to explore! The provinces are an intricate combination of serenity and picturesque landscapes. Enjoy quaint fishing villages and wharves, beautiful oceans to rocky cliffs with curious wildlife. You and your bestfriends will build memories to last a lifetime in cities you will never forget! Rejuvenate with your best friends and head to relaxing Monastery Spa and suites. 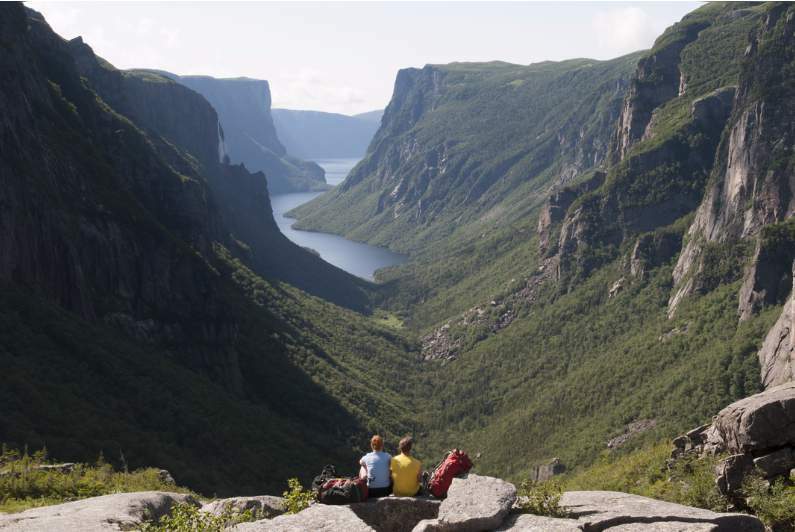 Enjoy the views of relaxing Humber Valley, on looking Marble Mountain. Disconnect for the outside work booking the Rejuvenating Getaway package, a 1 night accommodation in luxury suite with a fireplace and Jacuzzi, champagne, massage, chocolate and breakfast. Add on other luxurious items for the spa’s extensive list of novelties to enhance your weekend away! The most easterly national park of Canada, enjoy 400 square kilometres. You and your best friends can enjoy this Canadian paradise for hiking, camping and exploring! There are various bays and sheltered coast lines, ready to explore by kayak or boat. Or take to the land and get lost in the 11 km of stunning hiking trails! Camping here is ideal – there are many options including “oTENTiks” a mix of tent and rustic cabin or bring your own! The best guide for you and your besties to enjoy a trip is a local! Do just that with McCarthy’s Party, who offers an authentic experience of guests – with customizable experiences for everyone to explore, learn, laugh and relax. There are many multi- trip adventures for you or create a plan from scratch so you and your loved ones can choose what works best for you! Options include exploring Western Newfoundland and Southern Labrador which boasts 3 UNESCO heritage sites, accommodation, meals and more. Or enjoy trips to the French Island of St Pierre with boat tours and visits to Bonavista, Trinity and much more. The most authentic experience while covering lots of ground and living like a real local. Hidden in the corners of northern Newfoundland and Labrador lies Fogo and Change Island. While very remote, the added adventure of getting there makes it even more worthwhile. They are diverse and isolated communities that relay on the nature. To arrive you must take a flight to Gander then drive to a ferry which will take you directly. Once here, you will want to enjoy the nature that is unique anything you have seen. Enjoy copious hiking trails and take in the history at the interesting museums! Rest in the evening at Fogo Island Inn, a chic Nordic style hotel perched on stilts at the oceans edge! As per those who visit, until you see it with your own eyes, it’s hard to imagine the beauty and wonder that is Torngat Mountains. It’s landscape, Inuit culture and magical wonder combine to be a fantastic adventure. The journey is a little long but that’s all a part of the fun and memory building! You and your friends will stay at the base camp, and with professionals, will be guided through the artic wilderness hiking, wild life viewing, mountain climbing, icebergs and maybe view the northern lights. At base camp, there are many options for accommodations including soft wall houses or inter-shelters domes. Commonly referred to as New Foundland’s best kept secret – this award-winning ocean front spa and fine dining Inn is the perfect escape place. There are many wonderful spa packages to accommodate you and your friends including the Besties Day which includes pedicures, manicures and make up. Or choose the Beautiful Day package to enjoy body scrub, massage and lunch to name a few! Dine during your trip at the unique Secret Garden restaurant which boasts fine dining with stunning views. The Doctors House is just what the doctor ordered! This UNESCO World Heritage Site covers 1,805 square kilometres this park is a never-ending beauty full of delights and shocking wonders. Imagine hiking to towering cliffs overlooking waterfalls! After enjoying unique nature, enjoy the cultural heaven and creativity which boasts many festival, music and art. Hiking and boating are the best ways for you and your friends to enjoy the area and to see the most. In the evenings, there are copious creative folk in the area of Cow Head and town of Woody Point with unique artistic hubs where you will find eclectic and rich cultural performance and other forms of art. Continue breathing in nature through camping or using the RV park to wake up to the sounds and smells of nature. St. Johns is a lively city – a wonderful setting for a fun and exciting get away. As the capital city, it is a wonderful mixture of small town charm and luxuries found in the big city. Here you will find something charming for everyone, as you wander the colorful streets there are many lively pubs, boutique shops, café and art galleries. The food here is exquisite with many award-winning chefs offer east coast specialities. Every evening, you and your girls can head to George Street to find a lively night life including places to dance or hear life music. Enjoy the ABBA Boutique Inn, the perfect upscale London UK style hotel for your and your friends to rest and relax! Tick L’Anse Aux Meadows off your travelling bucket list and enjoy this one of a kind site. Located on the tip of the Northern Peninsula, this area offers authentic Viking history! Visit where the Vikings lived and worked and take turns learning the secrets and trades of the Viking past. Check out the weaponry, tools, cooking and other artifacts used in everyday life of the past. Discover the rugged landscape and terrific natural and cultural wonders through hiking, seasonal events and don’t forget to the head to the water’s edge for storm watching. For the most authentic experience, opt for a Bed and breakfast of which there are plenty scattered around waiting to welcome you! With Wildland tours, you will get to experience some the most incredible eco systems and diversity of wildlife that eastern Canada has to offer. This 8-day trip will leave you feeling inspired and energized as you learn about the amazing wonders of nature. You will see acrobatic humpback whales, dolphins, exotic birds and thousands of puffins. Enjoy delicious local fresh foods each day as you travel through various terrain and landscapes, including icebergs and glaciers. Throughout the trip you will encounter light houses, museum, hiking, flowers and the changing architecture of each town you pass through. Each evening, retire to local hotels for serene rest before another exciting day.